We are heading into an era of portable SSDs due to their speed and cost-effectiveness. Computers these days have USB 3.1 ports, with data transfer rates faster than ever before. 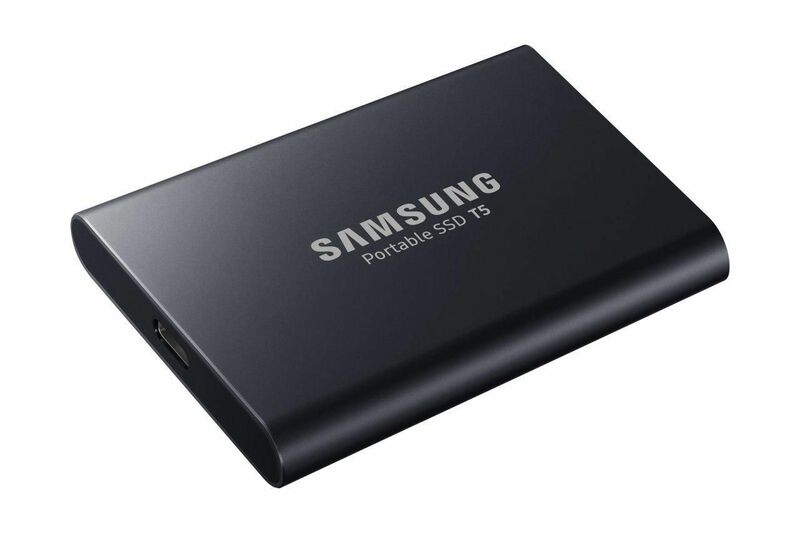 Given this state of things, Samsung has introduced a new portable SSD T5 drive, which comes with a lot of value-added functionalities. The latest T5 SSD drive supports a blisteringly fast 540 MBps speed read/write speed. On top of this, it is backward compatible with older standards. It can be used in conjunction with a USB-C to USB-A cable and a USB-C to USB-C cable. It is slightly slower than an M.2. drive. However, the speeds on the T5 SSD are close to Samsung’s desktop SATA SSDs, which is an impressive feat. The new T5 is a very lightweight device, weighing only 51 grams, and is just about the size of a regular business card. All such portable SSDs are a lot smaller than the regular 2.5 inch portable hard drives. In terms of security, T5 has an AES 256-bit hardware encryption and a three-year warranty. 250GB and 500GB are available in ‘Alluring Blue’ colors whereas the 1TB and 2TB are found in ‘Deep Black’ color. For comparison’s sake, Western Digital’s 256GB SSD device, which is slightly slower, is available for $99.99. Samsung’s EVO desktop SSDs are one of the best in the industry in terms of performance and their life cycle. Hopefully the portable ones can live up to that reputation. The new age data storage and transfer devices are a pretty good deal and provide great value for money. Samsung is on the move to capture the market for SSDs and we’ll soon be seeing more lightweight and extremely fast devices in the market. SSDs are not good if they remain power off for longer periods. AMD CPUs run too hot. Altavista rules! The chance of losing data only occurs if they remain powered off for a very long period of time e.g 2-3 years. Yes, Data loss was a big problem with early SSDs but this is being improved as SSD technology is evolving. But the main reason would be that they are too expensive on a per Gigabyte basis to store relatively unused data for archiving. For this purpose generally datacenters use HDD or Storage tapes which are considerably slow but can store huge amount of data. I will not be impressed if the speed is shown live! 4G theoretically speed is 150Mbps, but we get between 5 to 30Mbps, the same goes for USB 3.0, it is not as fast as it is claimed. You are confusing wireless technology with wired one. Wireless is very unreliable, i have an AC1800 router and its speed can vary from 850 Mbit connection to 20 Mbit varying room to room and distance. And this ssd supports USB 3.1 with a theoretical maximum of 10 Gbit (1.25 GB/s) which is FAR more then these hdds can offer. For now. Future generations of SSDs will strain the limits of USB 3.1 too. That’s why they keep creating new standards. USB 3.0 was created only a short while back but it has already been usurped by a newer standard. Are you the same Sohaib who was also the member of BHG community at Orkut in 2004-2008 period? Ah the good old days of orkut and dvd’s. Yeah indeed i was member back then there. wow you are comparing network speed to local peripheral port speed. such a foolish thing to say. Way too expensive for backing up data. Can anyone help me? my ssd in laptop is not being detected and i have important data in it.